We all have tendons in our hands that allow us to actively bend or straighten our fingers. The tendons that allow us to bend our fingers are located on the palm side of our hands. These tendons pass through several tunnels or “sheaths” that help keep the tendons in one place. 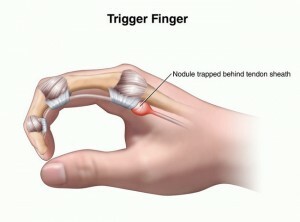 Disruption of movement is called Trigger finger. Trigger finger can be caused by one of two ways: one, the tendon sheath becomes thickened (from a traumatic event) or, two, part of the tendon can become swollen creating a little thickened lump called a “nodule” (from manual labor). If either of these occurs, the tendon cannot glide back and forth smoothly, thus causing the finger to become “stuck”. How do you know if you have Trigger finger? 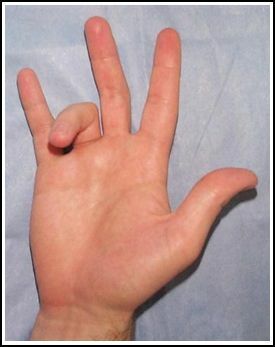 One of the main signs of trigger finger typically includes “clicking”, “catching”, “popping”, or “locking” of the finger when trying to bend it, causing it to “get stuck”. People that have severe trigger finger are unable to actively straighten their finger and require use of their other hand to straighten it. Who is more likely to get trigger finger? 2. Ice at the base of the finger (at the little lump in the palm of the hand) to help reduce the swelling. *Do not apply ice directly on your skin put place in a Ziploc bag and wrap in a paper towel. 4. Take a prolonged break for 4 to 6 weeks from activities that cause a lot of strain on the hand and fingers. 5. Periodically massage the finger where the nodule is located. This will help ease the pain. Make sure to massage sideways at the site of the lump at the base of your affected finger as this will aide in tissue repair. Massage gently. • Transverse friction massage including Astym. If none of these treatments prove effective, your physician may inject a corticosteroid (an anti-inflammatory medication) directly into the tendon sheath. If these treatments do not work and the trigger finger is negatively impacting your life, or your finger is stuck in the bent position, you may decide if you want to proceed with surgery. In the meantime, do not let it get to that point, give us a call today to get on the road to recovery (and a working finger.) (828) 348-1780.